The first farm we stayed at, ﻿Riverside Goats’ Cheese, made two varieties of goat cheese: a fresh cheese with herbs, and an aged cheddar-style cheese. Yes, that’s mold, but the good kind. This hard cheese is white, with a smooth, mild flavor and a slight earthy tang. This particular specimen is three months old. I’d never had cheddar cheese from a goat before. I’d always assumed it was a strictly cow thing, and orange like the Tillamook bricks I’ve had all my life. I learned cheddar cheese takes its name from the town of Cheddar, where it has been made for over a thousand years. The “cheddaring” process developed and used there can be applied to kinds of milk beside a cow’s. While we were there, our host prepared a new cheese from scratch. The milk is filtered, then added to a temperature-controlled stainless steel vat. The temperature is raised to around 29 degrees Celsius (84 Fahrenheit). Several grams of a starter culture is added. This is a freeze-dried bacteria of a very particular strain. It looks like flaky, yellow-ish powder. It’s called a “starter” because it starts the cheese. Stir it in, and let that bacteria multiply in there. The acidity of the milk will begin to raise, which is a good thing. That is a result of the bacteria, and it helps ensure that ONLY good bacteria exists in the milk, and not the kind that can make you violently ill.
Rennet is then added (20 drops or so to the 25 liters of milk we’re using to make this single cheese). Rennet is a combination of enzymes, traditionally extracted from the stomach of mammals (cows, usually), used to digest milk. 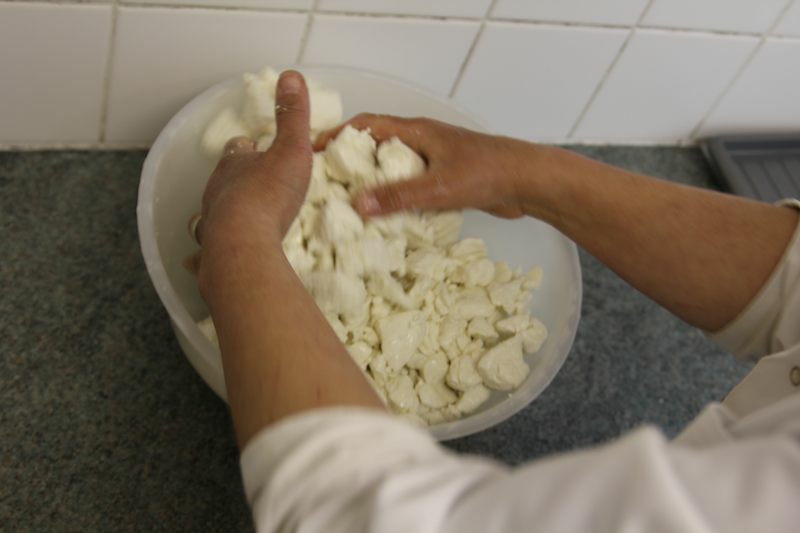 In cheese making, it coagulates the milk, separating it into the solid stuff used to make cheese (curds) and the liquid (whey). Within an hour, the milk became custard-like, with a watery liquid covering it. Then comes the fun part: cheddaring. A “cheddaring knife” (six dull blades held in parallel) is passed through the curds and whey, dicing it up. 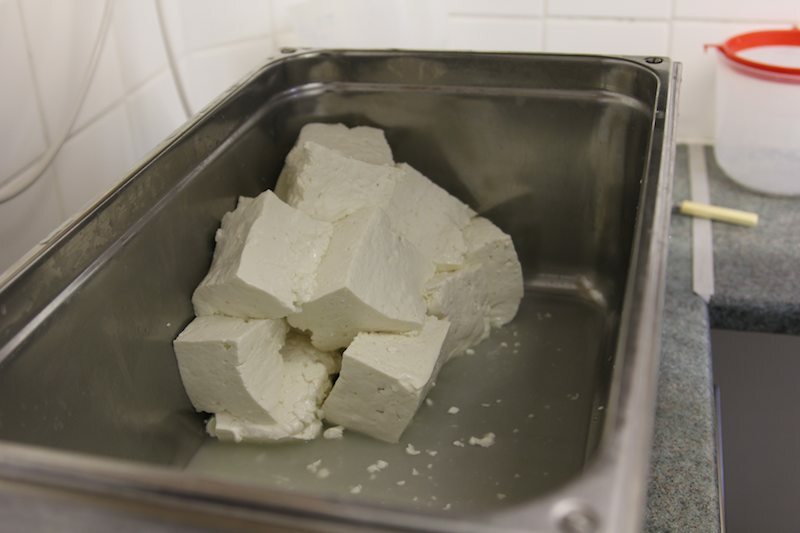 The size of those diced chunks of curd affects the ultimate texture and taste of the cheese. The goal is to create surfaces inside the curd for the whey to seep away. Too large, it may become lumpy with veins of mold running through. Too small, and the result may dry and become crumbly. She spent a lot of time ensuring the entire vat was cheddared consistently, and no large chunks remained, especially on the bottom. You then allow the whey to seep from the curd, then drain that whey away. You leave those curds to drain again, then cut them again. Drain again, then cut again. Then, finally, drain again. 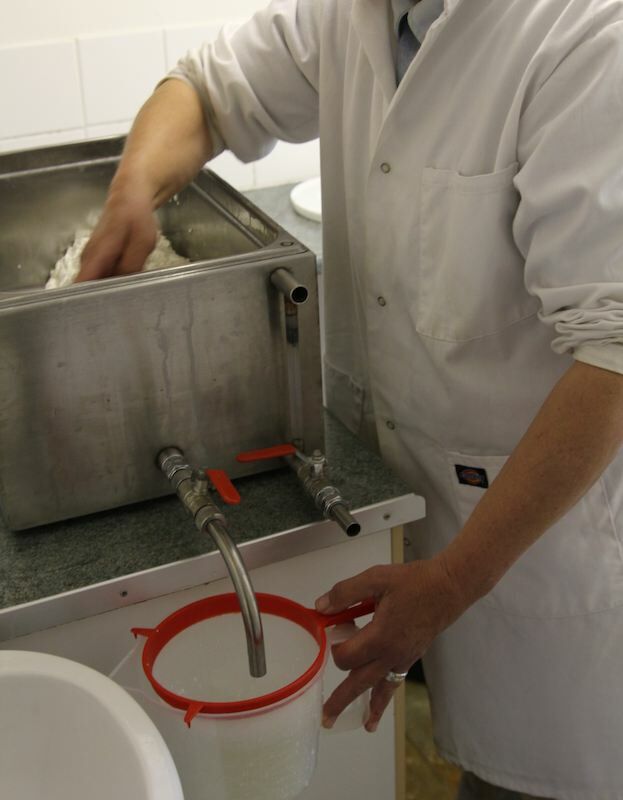 The consistency will become drier on each pass, from custard-like, to soft wet tofu, to hard tofu. The curds at this point is chewy and fairly tasteless. The flavor of cheese tends to come from the bacteria that inhabit it, and develops over time, as that bacteria consumes proteins and sugars in the curds. But before that happens, the curds are milled (broken up by hand) and salted. The salt helps the flavor. I read recently that salt functions to open up the tastebuds, to allow in flavors that otherwise would be missed by the tongue. The salt also acts a preservative. Also, thanks to the culture, the pH should have dropped to 5.4 or so — acidic enough to keep bad bacteria at bay. But this bowl of curds is not cheese yet. First it must be drained more, but in a controlled fashion that limits the loss of the protein-rich curds. For that, cheese cloth, a form, and heavy wood blocks are used. The salted curds are packed into a cylindrical form with holes in it (for drainage) and lined with cheesecloth. Round wood blocks are placed atop it, slowly squeezing the whey out. Additional blocks are added as the curds are squeezed down. 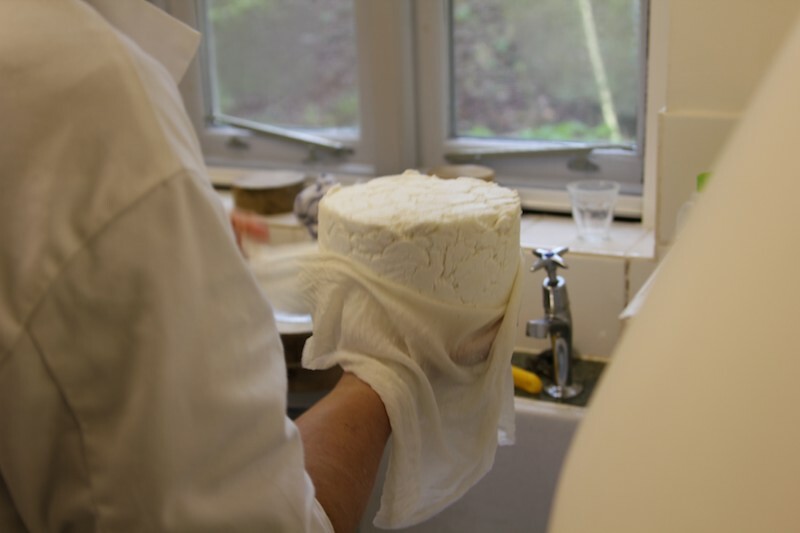 Cheesemakers tend to use the same blocks. The thought is that a bacterial culture unique to their cheesemaking operation lives on the surface of those wood blocks which adds a unique flavor to their cheese. The contraption in this photo is a spring-loaded squeezer that applies a delicate downward pressure. Too much pressure, and you squeeze out too much moisture. Not enough, and it can rot. The draining can take a full day, or more. 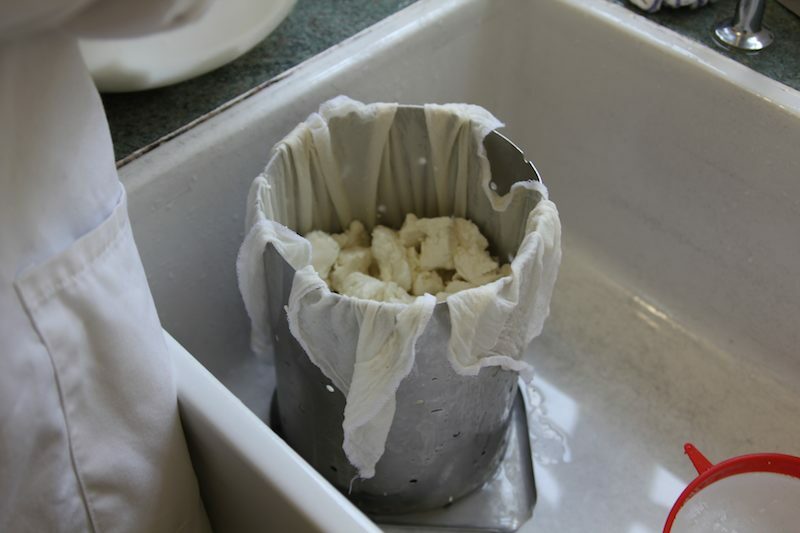 Once drained, you extract your squeezed, round-shaped block of curd which is looking more and more like cheese. This particular cheese is only half-drained. It still had more time to go. Look how small it is compared to the initial vat of milk. 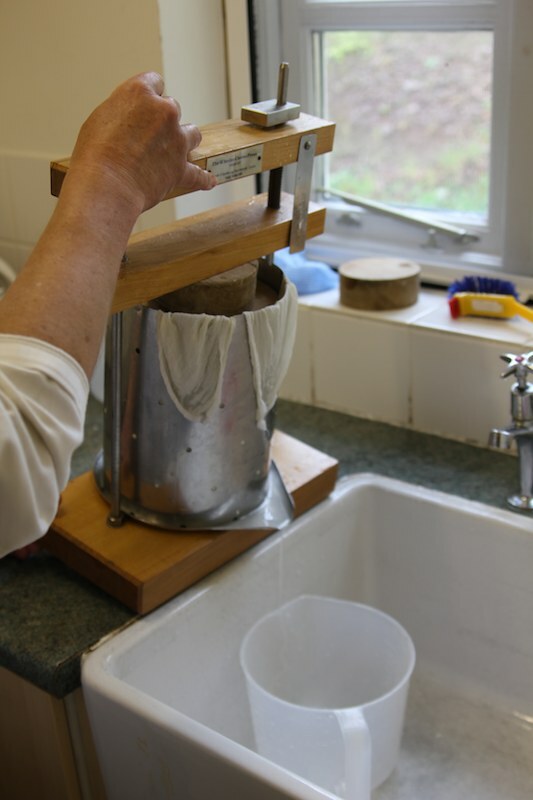 Once drained thoroughly, you extract the cheese for the last time from the form and cheesecloth, then set it on a shelf in a cool, ventilated room. After a few days a fine white mold will cover the cheese. 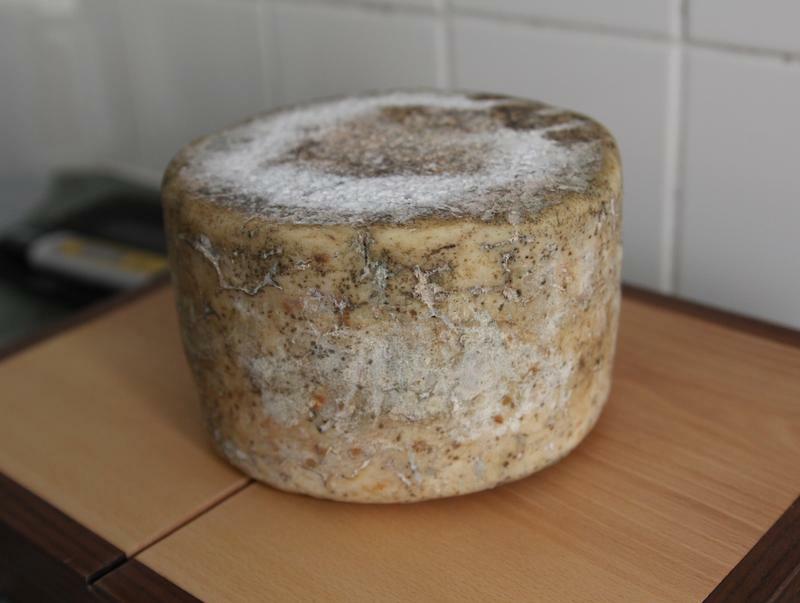 Here is our cheese, about two days old. This mold is a good thing, as it helps hold in moisture, necessary to the bacteria inside. 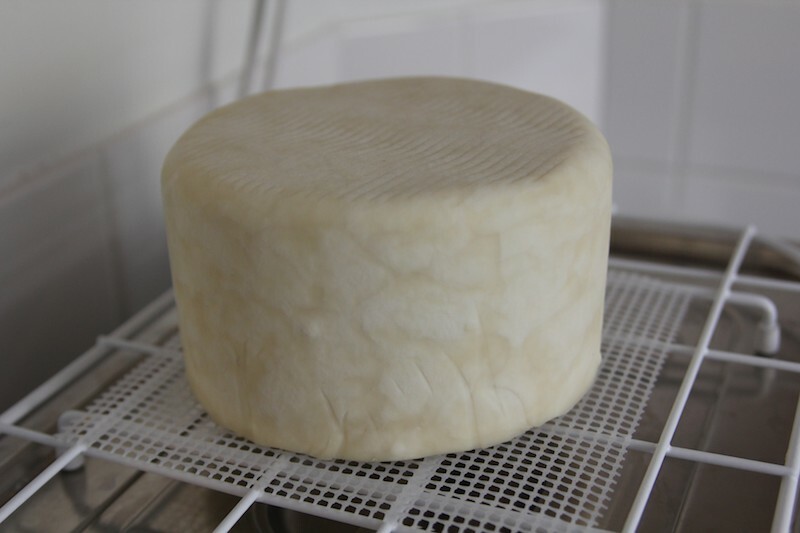 As time passes, other molds may form (as can be seen in the first photo on the three-month cheese). If it gets too nasty, you can wipe the excess mold off with a damp cloth. For this particular variety of cheddar, there’s not much to do now but wait for the flavor to develop to the desired sharpness. There’s many other things one can do, from poking tiny holes hrough the block so mold can grow inside (as seen in blue cheese), to placing it in a bath of brine. 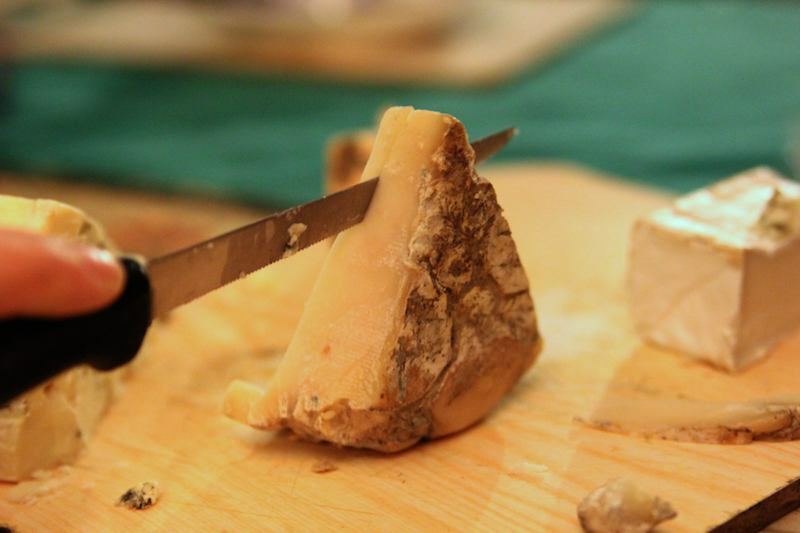 There are hundreds of cheeses out there, and a different method for each. Ask me what I did yesterday. Go ahead, ask. 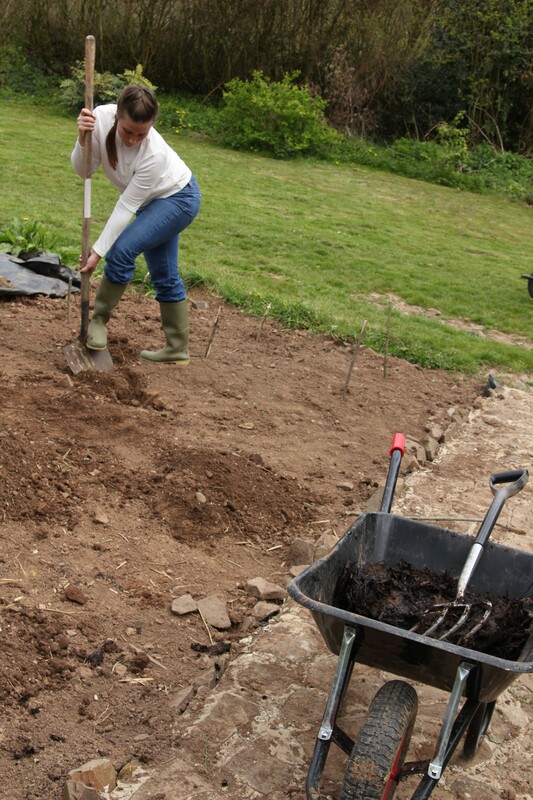 Halbe digging holes and filling them with manure (1 year old poo) to prepare for planting squash. First, I covered poop with straw, then I shoveled poop and then I forked 1 year old poop into holes. Fun was definitely had. Most of this is part of our daily routine which has been handed over to me and Devon. We wake up around 7 and are on the farm by 8 in our wellies to tend to the poultry (ducks, geese and chickens) and the pigs. 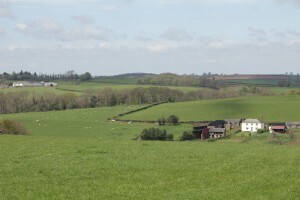 We learned the holy trinity of farming – food, security and water (FSW which I remember by thinking of DSW – once a city girl always a city girl). So, we feed all of the animals, give them clean water, look for any eggs (I found two this morning!) and then make sure the electric fence is turned back on. 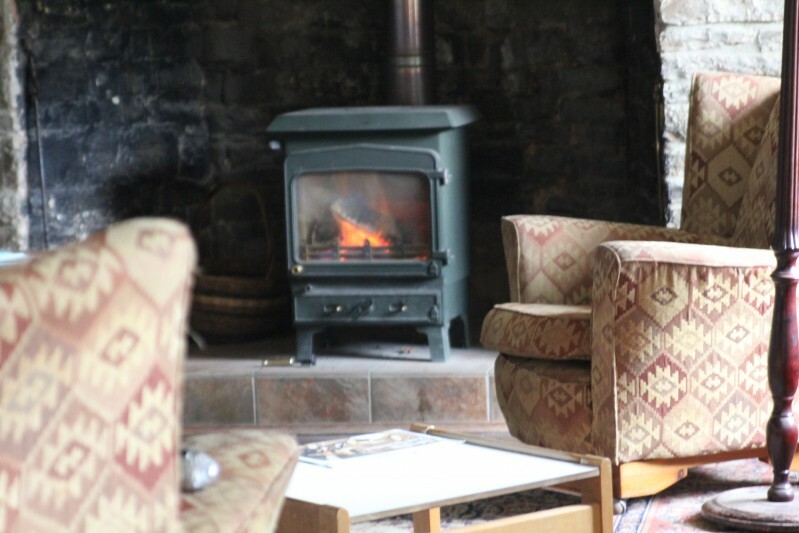 Can’t let the animals get out or the foxes in. By 8:30 we’re in the goat barn just as Ann, our charming host, is finishing up her milking. She only milks the six goats who had kids this season and uses it to make soft cheese, hard cheese and milk for drinking (I put it in my tea each morning). She actually showed Devon and me how to milk the other day. We both successfully milked, oh, about 1 tablespoon. It’s actually pretty tough to do. 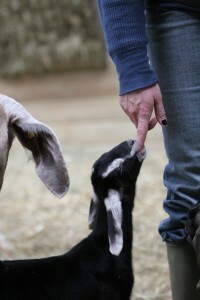 As Ann is finishing with the goats, Devon and I work to clean up the pen and finish the morning routine. We fill the troughs with hay, fill their water buckets with clean water, and lastly deal with all of their poop, of which, there is a monumental amount. First, we get straw and work to cover all new poop and moist spots on the floor with new straw. Then, we wet the floor of the milking area (it’s concrete) and scrub it with the “wet broom” to get all the poop off the floor. Next, we let the goats out of their pen to wander about in the fields and begin to shovel the poop. 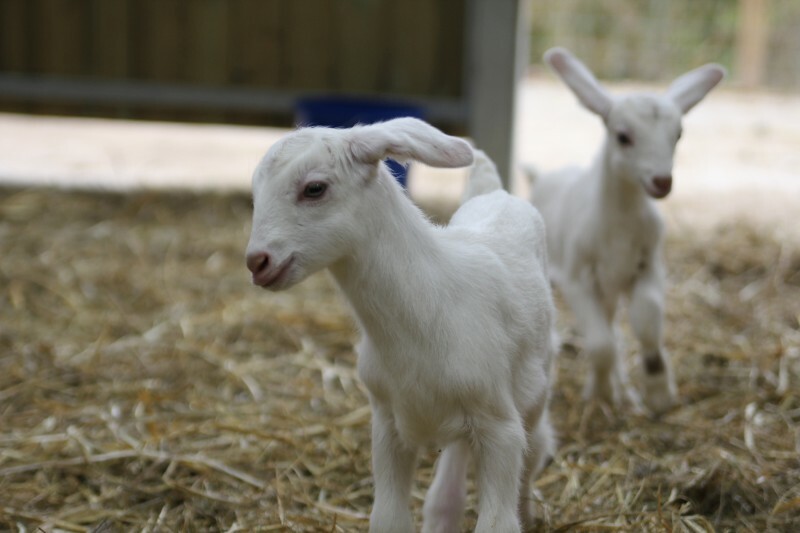 You’d think that all goats do is poop (which wouldn’t be totally inaccurate) based on how much we end up shoveling. 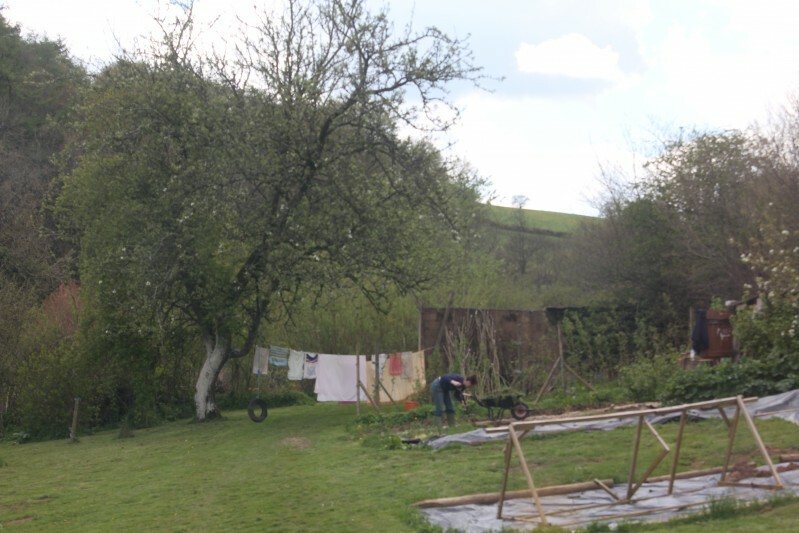 After our morning routine is over Ann gives us our tasks for the day which have included hoeing in the garden, hand weeding, weed wacking or “strimming,” and weeding with a pitch fork. Yesterday I worked in the garden getting a bed ready for squash. The dirt here is rocky and dry so they use a lot of manure, which is created from the shoveling we do each morning. My task was simple – dig a hole about 10 inches across and 8 inches deep. Next, I go to the enormous pile of manure, which is really just 1 year old goat poop, and fork enough of it into a wheel barrow. I wheel that over (trying not to tip it onto myself, which I almost did) and then fill the hole with manure. Then, I cover the manure with dirt and repeat 9 more times. I actually did this over two days and Devon helped with the last four. He’s a trooper. Today I’m picking rocks out of seeded dirt so they don’t get caught in the mower and splitting wood. My muscles are growing as we speak. A billy kid (i.e. a male kid) suckling on Halbe's finger. How we stay warm in the living room. Hearty and quick. Bread was made yesterday (wheat flour, salt, yeast, walnuts, water). Eggs were from our hosts’ hens. Butter was from Devon county cows up the road. 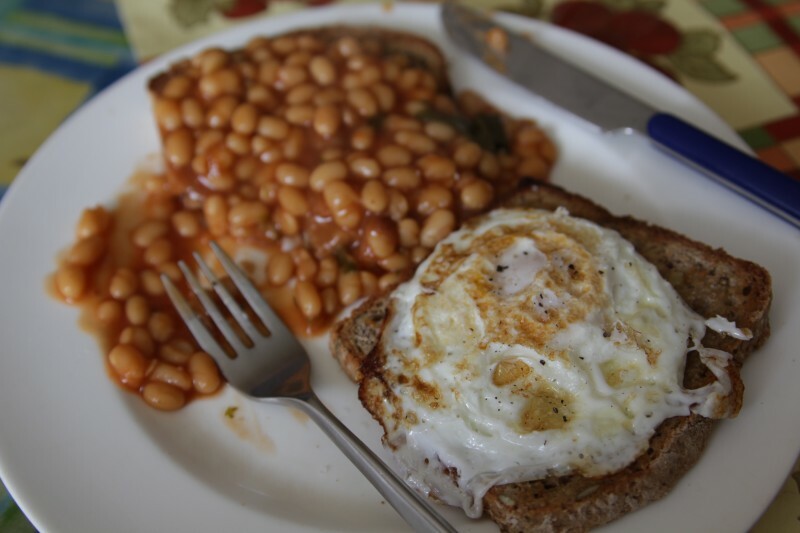 Beans, well… they’re Heinz, but stewed with a few items from the garden. All in all, a pretty locally sourced meal, and I’m told one that is very traditionally British. 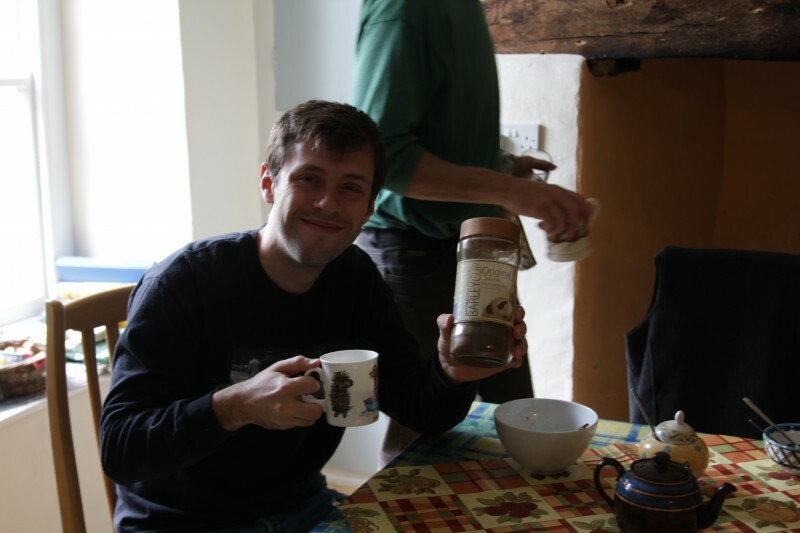 After, I had a “barley cup,” a hot beverage made from roast barley and milk. It’s considered an alternative to coffee (a result of the rationing in Britain during WWII) but has no caffeine. It tasted like well-roasted (maybe even slightly burned) wheat. Not bad, actually. Very wholesome. I’ve officially had the most embarrassing moment to date on our trip and, unfortunately, it involved an impressionable English boy. Whoops! 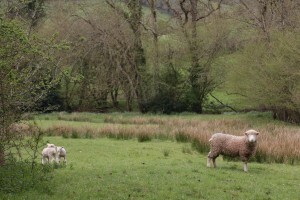 Devon and I had the day off yesterday and we had a wonderful 8 mile walk through mid Devon county. 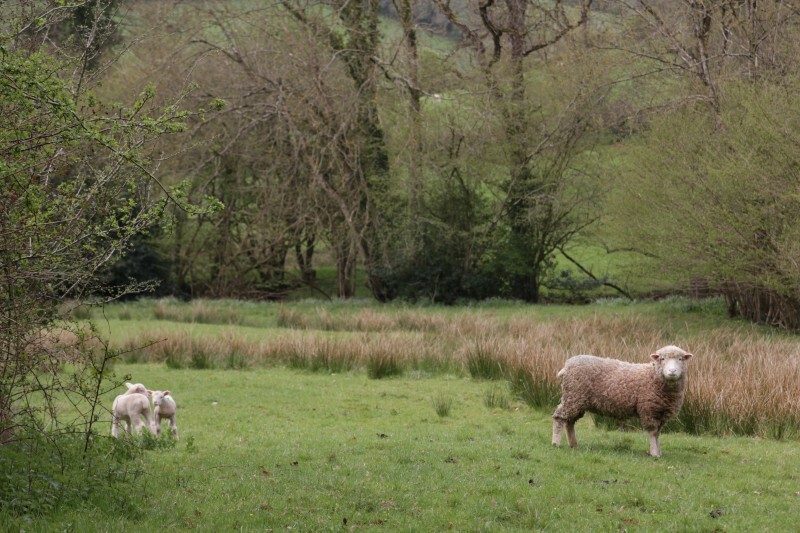 While on the walk, we passed many beautiful fields with sheep, cows and goats as we meandered through the narrow, winding streets lined with hedges almost as tall as I. As you walk along the streets, you come across fields with animal grazing but no public toilets. Once I was in position a few seconds pass and as I’m finishing, a young boy looking to be about 8 passes me on his bicycle riding alongside with his dog. Before he knew it, his innocent Sunday ride turned into an educational tour of how a woman pees in the wild. As he passes me his eyes pop out of his head, his jaw drops and he stops pedaling. Luckily the momentum of his bike continued him on his way past the field. Once I see him, I yell, “oh, excuse me.” He continues on his way with the image of my bottom seared into his memory. Devon and I make eye contact. He gives me this look of, “oh yes, that just happened.” I burst out laughing until I have tears in my eyes. The look on that little boys face was priceless. Can you imagine, you’re barely learning how to read and you come across a woman peeing in the field? Now THAT’S an education. I was mortified enough that I put on the sweater wrapped around my waist in the hopes that it’d mask my real identity should we pass the boy again. It was more for my comfort than anything though because how many people walk the streets of Devon? Sigh. I guess this does prove that Americans are less civilized than the British. 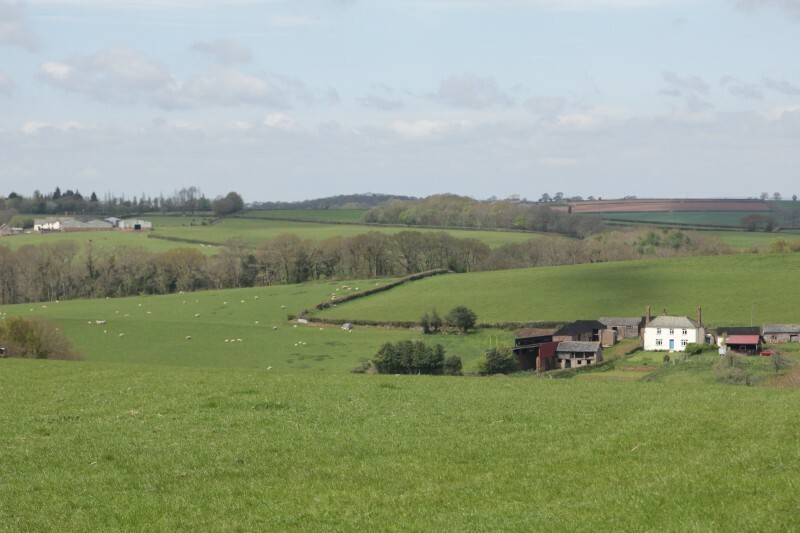 Just a quick post to confirm that we made it to Devon County and the farm. We’ll update with details on the food and our first day of HelpX-ing soon. 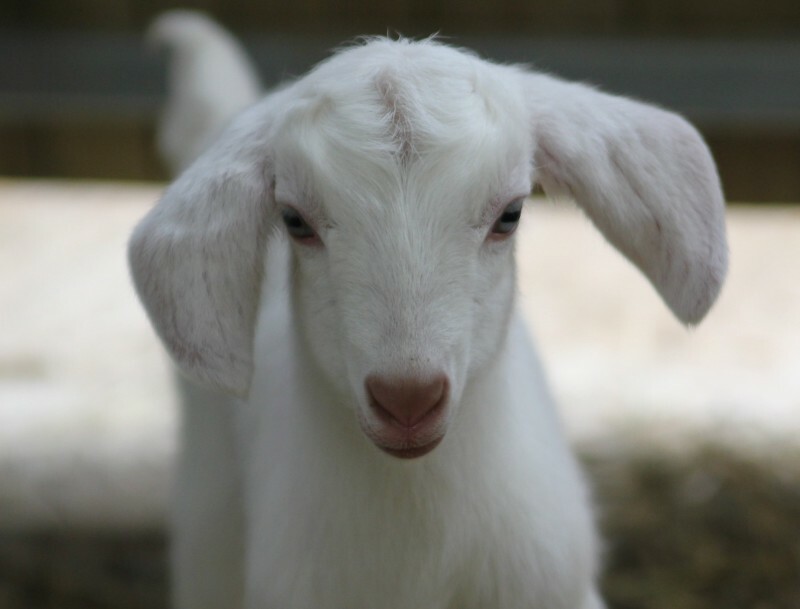 Until then, here is a photo of a three-day-old goat.